CASPIAN ECOLOGY - Caspian Ecology 2018: maximum attention to environmental protection! On November 16, the 9th Azerbaijan International Environmental Exhibition, Caspian Ecology 2018, which was organised by Caspian Event Organisers (CEO), completed its work at Baku Expo Centre. The exhibition is supported by the Ministry of Ecology and Natural Resources of the Republic of Azerbaijan. According to international experts, Caspian Ecology is considered a major event on ecology and environmental protection held annually in the Caspian and Caucasus regions. This year’s exhibition was attended by 43 companies from Azerbaijan, Britain, Germany, Italy, Turkey and other countries. In general, Caspian Ecology 2018 exhibited developments in the field of efficient use of natural resources, systems for collecting and recycling solid waste, attracting people's attention to environmental problems and their solutions. The companies presented equipment for disposal and recycling of waste, alongside water treatment systems, paper and cardboard production, oil and gas exploration and processing services, centrifugal technologies and much more. The participants and visitors were impressed by the business programme of Caspian Ecology 2018; as part of it, for the first time, bilateral meetings were held between exhibitors. B2B meetings between Italian and local companies, which was organised by the Italian Trade Commission (I.C.E. ), and the international scientific-practical conference on the theme “From fishing towards sustainable aquaculture and protection of marine ecosystems” became priority factors in the meetings of professionals. Discussion around the development of aquaculture in the Caspian region, and problems, as well as tools for management and conservation of fisheries helped to find a solution for restoring fish stocks and especially valuable fish species in the Caspian Sea. The international forum dedicated to the restoration of wildlife in the Caucasus, raised the theme of protecting the biodiversity of the region, identifying priorities for developing the ability to natural restoration, strengthening regional cooperation in this direction. Great interest was also aroused by the CSR-project “Because We Care”, which brought together various craftsmen, and a special stand which was featuring recycled samples of raw materials in the lobby. 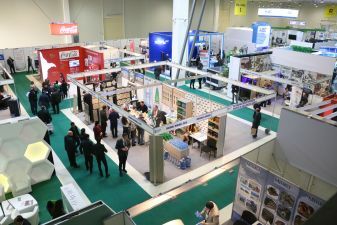 Thus, the International Caspian Ecology 2018 Exhibition contributed to the expansion of business contacts and exchange of experience, while providing an ample opportunity to get acquainted with new equipment and industry trends; it gave an additional impetus to the work carried out in the area of environmental improvement and protection.